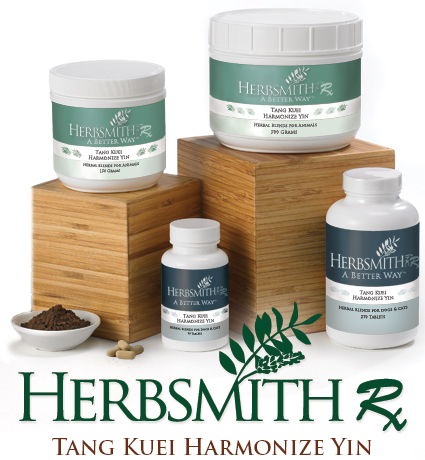 Herbsmith Rx Tang Kuei Harmonize Yin is recommended for yin deficiency of kidney and liver. In veterinary practice, Tang Kuei Harmonize Yin is useful to assist in the management of older, yin deficient patients with dry, hacking cough, restlessness at night (the yin time of the day), dementia and senility, hyperthyroidism. Many other western defined disorders would be appropriate TCVM presentation. Yin deficiency is best seen as dryness, intolerance to heat and deficiency heat. Tang Kuei Harmonize Yin is a variation of the classic formula Rehmannia Six (liu wei di huang wan). This formula is used to aid in the management of kidney and liver yin deficiency as well as nourish and move blood.